The Clemson Tiger Band is still celebrating their National Championship over Alabama as are their fans. One special fan decided he would continue the celebration in school. This little guy over Christmas asked for a Trombone and Santa delivered. Trough Youtube videos he studied Clemson's famous fight song "Tiger Rag". That's right he is self taught. The next step was to impress his friends and the world. 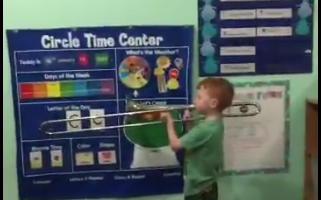 All we have to say is we absolutely love his parents for encouraging and supporting his interest in trombone. He is well on his way to one day marching in the Clemson Tiger Band.